I have a confession- I am not a fan of traditional biscotti. 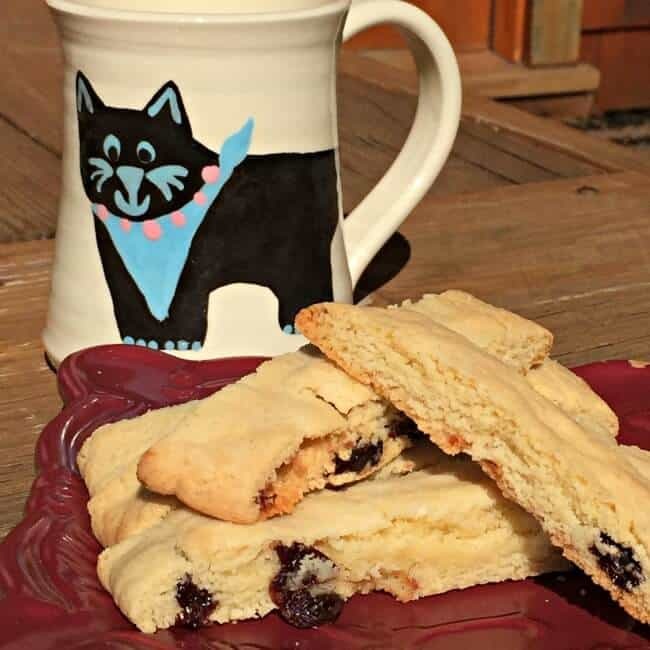 It's because I like a soft, chewy cookie and biscotti is typically crunchy- even to the point where it can be hard to bite off a piece gracefully! Which is why I suppose so many people dunk biscotti in their coffee- to soften it up a bit. Me? I don't drink coffee- so maybe that's another reason that biscotti never appealed to me. Until I found a recipe for chewy biscotti, gave it a try and was hooked! 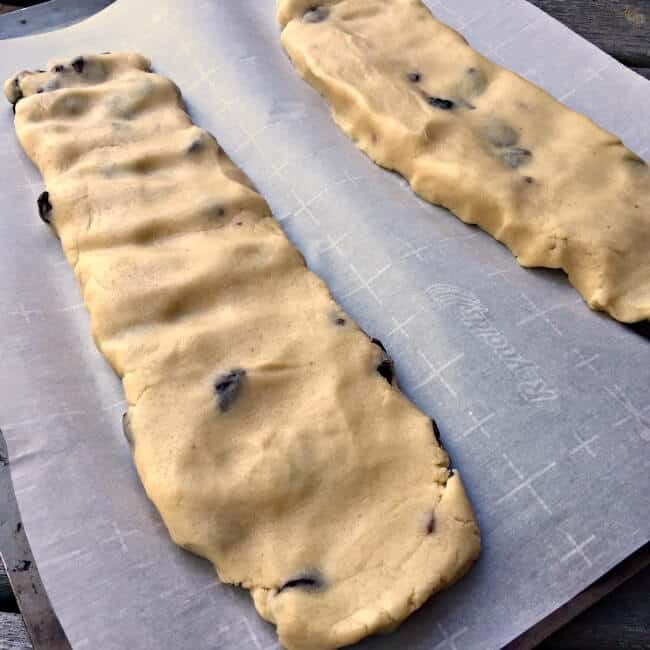 So I played around with the ingredients a bit, adding in dried cherries which are a family favorite and I think I've created a perfectly delicious chewy dried cherry biscotti recipe that is sure to be a hit with your kids for breakfast or dessert! The key to the deliciousness of this recipe is both the almond extract as well as the dried cherries. What? 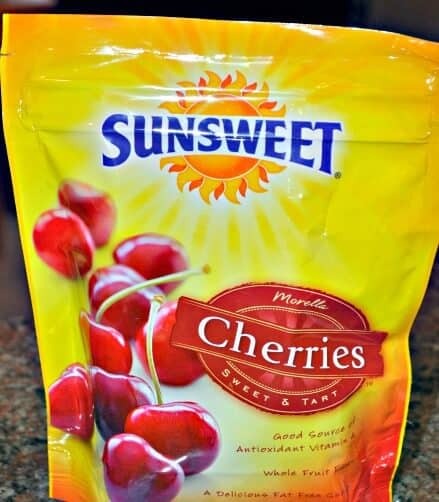 You've never purchased dried cherries? Well, they come in a package like this, and can usually be found in the produce area of the grocery store in the same place where they display nuts and other dried fruits. The dough quickly comes together and is then shaped into two long logs on a parchment-lined baking sheet. 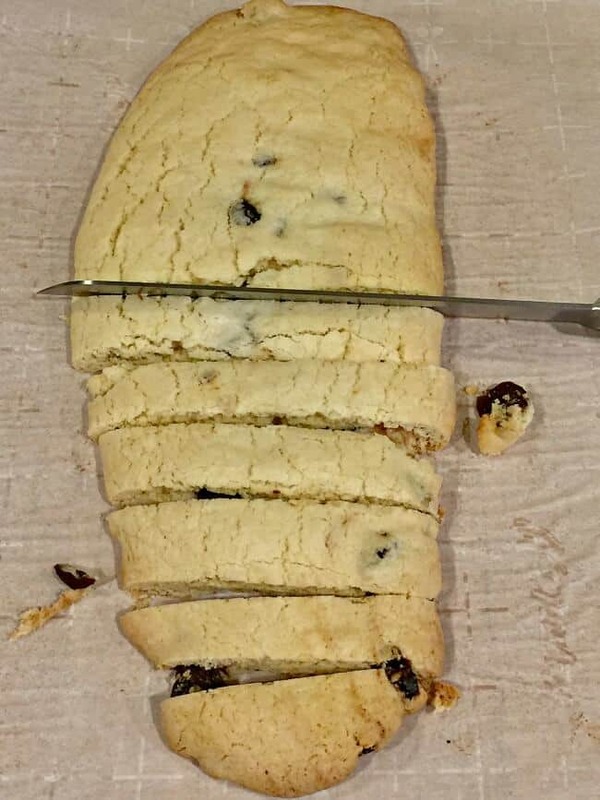 After baking the biscotti, allow it to cool for 20 minutes before slicing into individual pieces using a serrated knife. Turn each piece onto its side to expose what was the interior of the cookie. Return to the oven for 5 minutes to crisp slightly. This is a delicious and chewy biscotti that is sure to be a hit with your kids! 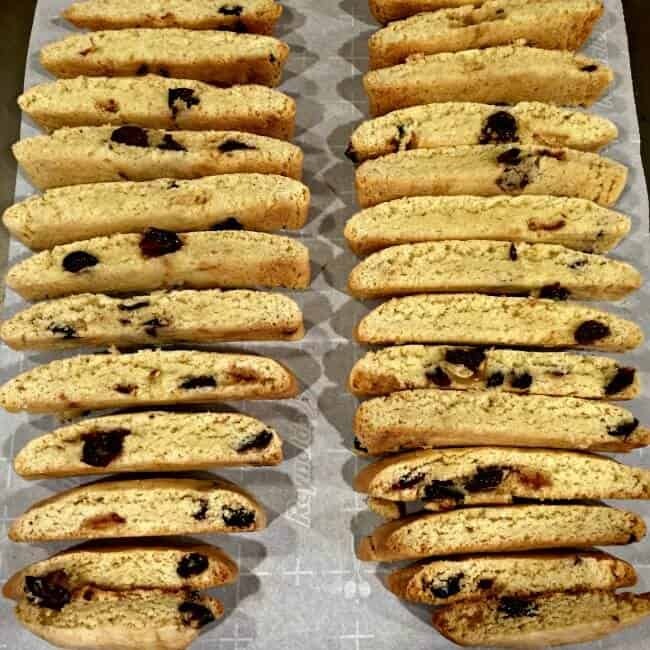 Here is my homemade chewy dried cherry biscotti recipe! Line a heavy rimmed baking sheet with parchment paper. Mix together the flour, baking powder, and salt, and set aside. Using your mixer, beat together the sugar, butter, eggs, and almond extract until light and fluffy. Mix in the flour mixture and then the dried cherries. From dough into 2 long logs- the length of the baking sheet, about 2½" wide and 1" tall. Bake until golden brown, about 35 minutes. Allow the logs to cool for 20-30 minutes (but don't turn off the oven). Slice the logs into 1½" wide slices. Turn each slice into its side, cut side up and return to the oven for 5-10 minutes to crisp just a bit. Allow to fully cool before serving. Best enjoyed with a cup of tea or a glass of cold milk! « Halloween Party Ideas for Kids! 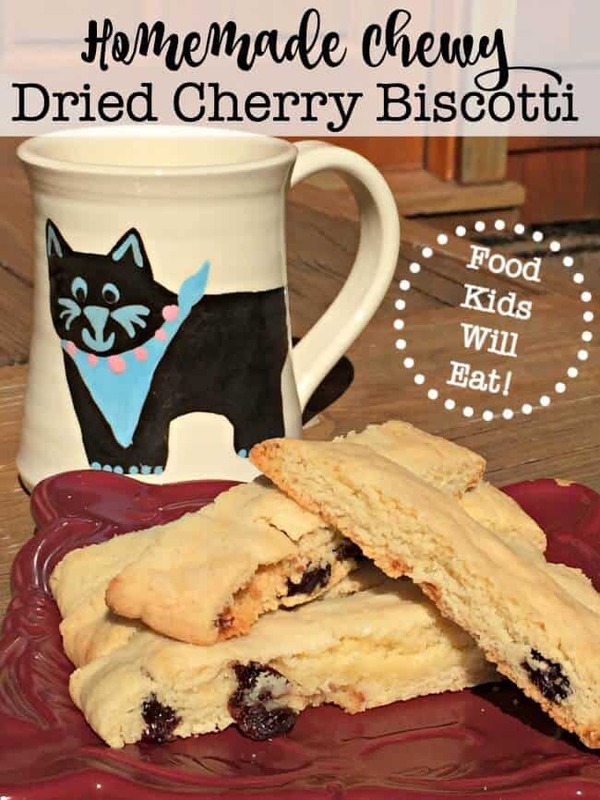 These Chewy Dried Cherry Biscotti look delish! I don’t see the recipe – Is there a link?